360 Lace Frontal is the new trend and popular in hair extensions and weaves market.Are you interested in 360 lace frontal? What do you know about this type hair product?How to install a 360 lace frontal yourself? Here we will answer all of the questions you may have about 360 lace frontal. What is the 360 Lace Frontal? 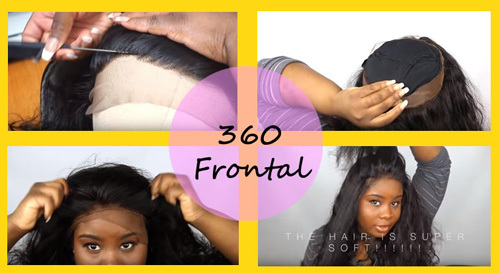 360 lace frontal makes it even more easy to install your wefts as well as achieving a full natural hairline around the entire circumference of your styled lace frontal in less time. . Whereas regular lace front closure is installed on only the front of the head, a 360 lace frontal goes all the around the head, leaving a round opening in the center. 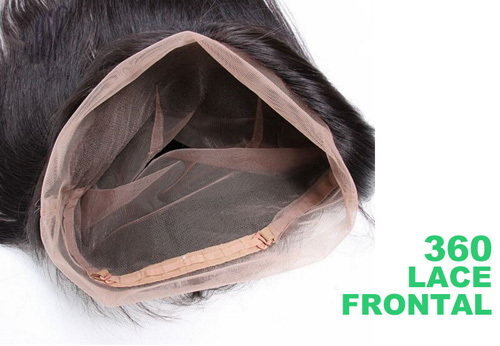 When you use a 360 frontal closure, you will save more time to enjoy your perfect natural-looking. Installing a weave with a 360 lace frontal also requires less bundles. Usually only 2-3 bundles are needed to complete a full with these 360 lace frontals.You will still require wefts matching the hair texture to complete your desired look. Our store has two textures, which include Brazilian, Malaysian ,Indian, Peruvian body wave and straight hair.360 frontal closure can add length and volume to your own hair like our other products such as weaves and closures. The size of lace frontal closure is 22.25 inches in circumference x 4 inches in length (front to back) x 2 inches,this lace frontal is made of 100% human quality virgin hair, featuring bleached knots,and people can not distinguish it from your own hair. How to install a 360 Lace Frontal? 1.Firstly, you should begin by prepping your natural hair weaves or extensions. This means washing, conditioning and trimming your real hair. After making any wanted changes to your 360 frontal, you may need to trim away excess lace from the back of the piece. 2.After you’ve finished prepping, you need to style your natural hair in either plaits or cornrows and then put on your two wig caps. Take the needle and thread and sew the two wigs caps down using big stitches in a circle around the crown of your head. Next, take scissors and cut away the excess from the top wig cap. 3.Next, apply your 360 lace frontal and position it carefully into the desired area along your hairline and braid or pin the hair out of the way. Once the frontal closure hair is in the right place, sew it down along the outside of the top wig cap. 4.After the 360 lace frontal has been installed, you are ready to begin gluing wefts down in the remaining circular area. You can prep this area first by spraying it with hairspray, or you can simply begin gluing down the tracks. Start by gluing in the back and work your way upwards. Be sure to measure the track against your head before cutting and gluing. 5.Once all tracks have been glued into place, it is time to cut away the remaining lace from the hairline. After trimming the lace, you can either use lace adhesive or styling gel to secure the frontal into place. After accomplishing all the steps of the above, now you will have installed the 360 lace frontal.This 360 lace frontal closure which is made of 100 percent human hair is more convenient for women to make a high ponytail hairstyle, you do not need to do much work and easily style your hair with this lace frontal.